Skin the bananas and cut into chunks. Put the sugar, water, cinnamon and cloves (stuck into the strip of lemon zest) in a heavy saucepan. Stir over the heat until all the sugar is dissolved. Add the banana chunks, bring to the boil, turn down the heat, add the lemon juice and leave to bubble gently for 30-40 minutes until the syrup has reduced and thickened and the banana has darkened to a deep reddish-brown. 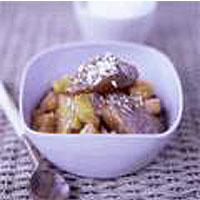 Remove the bananas and place to one side (take out the lemon zest with the cloves). If using, add the rum to the syrup in the pan, bubble up until it thickens again, and pour over the bananas. Leave to cool (the syrup thickens more as it cools), then stir in the diced papaya or pineapple, and finish by adding the toasted nuts. This dish is delicious served with soured cream or thick yogurt.